The luxury lifestyle company releases its much awaited professional quality, cruelty-free and vegan makeup brush set. The brushes themselves are carefully designed to deliver flawless application of both creams and powders. Luxury accessories company Andre Lorent Lifestyles is known for its innovative and practical designs with a focus on high-end products without a high-end price. The company’s newest product release, the #1 Pro Makeup Brush Set, has already garnered an extremely warm welcome from customers seeking cruelty-free, vegan makeup brushes. Andre Lorent has built its reputation on identifying specific problems and creating innovative solutions to those problems. In this case, the company saw a lack of cruelty-free, vegan makeup brushes that were of a quality high enough for professional use. While there are other vegan makeup brushes on the market, many are made with low-quality synthetic fibers and poor construction. The company’s solution is its design using LuxeFiber, an extremely soft, high-grade synthetic fiber that resists falling out and breakage yet is luxuriously soft. The brushes themselves are carefully designed to deliver flawless application of both creams and powders. There are five brushes in the #1 Pro Makeup Brush Set, including what Andre Lorent calls the “five most essential daily brushes.” The set includes a foundation brush, blush/powder brush, eyeshadow brush, angled eyeshadow/eyeliner brush and a lip brush. As Andre Lorent is known for upmarket travel goods, it’s not surprising that the company designed a stylish and well-made case for the brushes. Constructed of hard-sided cream vinyl, the cylinder-shaped case is solid and substantial, yet looks elegant on a countertop or vanity. The #1 Pro Makeup Brush Set has already gotten a great many five-star reviews on Amazon, but the company is proudest of its reception from the professional community. Makeup artists and stylists have expressed their excitement about finding a brush set they can use with vegan clients, without having to sacrifice application quality. The distinctive case also makes it easy for them to keep the vegan brushes separate from any other brushes they carry. 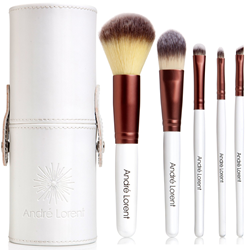 The #1 Pro Makeup Brush Set is being sold exclusively through Amazon and, like all Andre Lorent products, features a 100% Lifetime Quality Guarantee. Andre Lorent Lifestyles is a luxury accessories company specializing in upmarket travel and lifestyle products. For more information, contact Andre Lorent Lifestyles via email at support(at)andrelorent(dot)com, by visiting the company website at http://andrelorentskincare.com/.